On Mumbai, 9 August 2016 NovaPlay, India’s leading gaming platform for multiplayer gaming communities has come up with special offers. “The NovaPlay Lock-n-Load Sale- Independence Day Edition” to celebrate India’s 70th Independence Day. Riding on exemplary customer feedback and with Independence Day around the corner, ‘The Lock-N Load Sale’ offers a 3 day sale to celebrate the true spirit of the occasion that will begin from 15th August and will last until 17th August. NovaPlay. in is fast becoming the go-to destination for gamers in India to buy their favorite game titles at the best price. 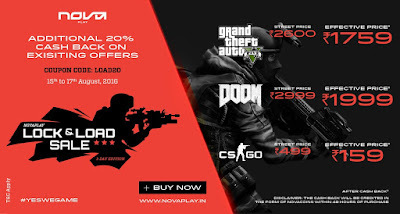 During the NovaPlay Lock-n-load Sale, NovaPlay will up the game by offering its customers; additional 20% cash back over across the store. 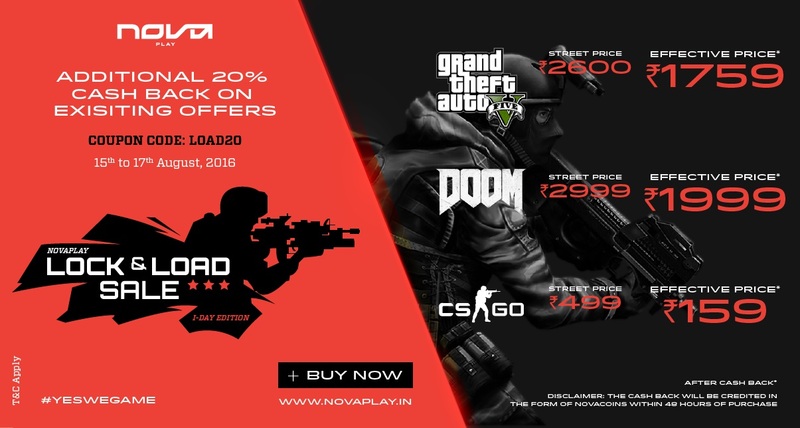 "We are delighted to launch the Independence Day edition of the NovaPlay Lock-n-Load Sale. The sale is a part of our thoughtful endeavor to double the joy of the gaming aficionado thus offering them an opportunity to explore and experience games at never seen before prices in India. NovaPlay has always endeavored to create memorable experiences for the gamers and will continue to take such efforts in the future." SO game lovers here are the good news for you all. We hope you all will get benefit out of it. Here all about NovaPlay Lock N Load Sale Independence Day Edition. Any query or question do comment below. Thank you for reading.